Like with my response to The Watch, Jay Roach’s The Campaign is really the sort of picture that can’t be taken too seriously. Strung together by a series of modest comic interludes, The Campaign might suggest broader appeal with its timelier premise, but it all falls in line with many of Will Ferrell’s previous work. The Campaign operates much in the same way that The Other Guys flimsily implemented moments of social relevancy. Scenes of pandering to constituents and spoofing the Koch Brothers (played with gusto by Dan Ackroyd and John Lithgow) are largely utilized as a source of reference rather than questioning their relevancy. While disappointingly thin, The Campaign success hinges largely on how welcoming you are of Will Ferrell and Zach Galifianakis’ acts. Following Roach’s work on the HBO film Game Change I had modest expectations that he would utilize his more dramatic sensibilities as a way of cushioning, perhaps even enhancing, The Campaign’s satire. 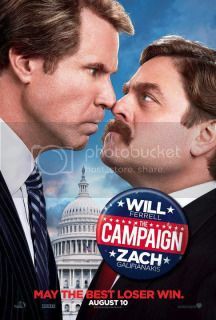 But The Campaign plays out much in the same way one can expect – anyone familiar with Will Ferrell’s work previous film has seen this precise template employed before. This isn’t necessarily a bad thing. Ferrell may not be the best comic, but he has a particular sense of timing and vocal command that elevates his pictures to that of say, most contemporary Adam Sandler pictures. Most crucial to The Campaign’s success stems from his sparring partner in Zach Galifianakis, whose man-child character gives Ferrell the opportunity to branch out a bit more. Like with Mark Wahlberg in The Other Guys or John C. Reilly in Step Brothers, Zach Galifianakis is provided with enough comic material as Ferrell’s co-star to come off looking great. But as noted before, it’s all of little consequence. My immediate reaction to the picture upon walking out of the theater was that it was escaping my consciousness. And as I have been delayed in getting any sort of response on the film down, I am finding it increasingly difficult to recall any particular moment in the picture overall. I like components to The Campaign, but that’s largely a visceral response to some of the picture’s more outlandish humor. With absolutely no cerebral appeal, I perhaps would have been a bit kinder to the picture if I had written this review prior to viewing something as intensive as Paul Thomas Anderson’s The Master - but reflecting on The Campaign now just feels so inconsequential and slight.